The San Francisco Giants have seen some of their best players signing up for the World Baseball Classic this off-season. 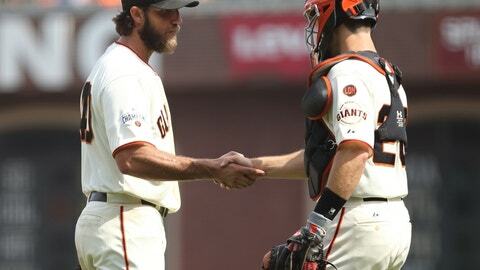 Now, according to sources, Jon Morosi is saying Team USA officials are interested in adding Giants ace Madison Bumgarner to their roster. San Francisco Giants catcher Buster Posey, starting pitcher Johnny Cueto and shortstop Brandon Crawford have all agreed to play in the WBC. There is no word yet if Bumgarner has or will say yes. According to the report from Morosi, Bumgarner may not be asked to pitch for Team USA until after the end of the first round. Bumgarner has pitched over 200 innings for six straight seasons, including the most he’s ever thrown in a single regular season this year with 226.2 innings pitched. He has also thrown another 102.1 innings in the post-season. Bumgarner may be coming off his best season ever, however, so it is possible that the innings pitched haven’t impacted his performance. Bumgarner finished 4th in the Cy Young voting this season, so there is obvious interest from Team USA for the strong left hander to join them in their most meaningful games. His success in October alone makes him a huge get for Team USA, if they can convince him to join their team. Make sure to check back each day for all the latest Hot Stove news on the Giants from Around the Foghorn.